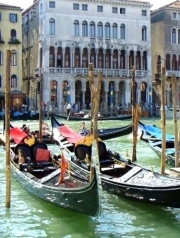 DREAM Bed and Breakfast is located near the historic centre of Venice. The B&B DREAM can easily be reached from Highways, Railway stations of Mestre and Venice. It is convenient for the airports in Tessera, Venice and Treviso. Bed and Breakfast “Dream”is surrounded by a new wood of Mestre in the magic and strategic location for quickly and easily reaching the historic centre of Venice and other important historic and artistic cities of region Veneto. You’ll always be welcome in our house for a pleasant stay, peace, quiet and relax. It’s an environment where the comfort end warm of the house are joined with the comfort of the hotel, which only modern building can give you. The B&B “Dream” is a spectacular oasis of pace and quiet at the edge of the cities Venice and Mestre. It is a new built which was open in 2007 with a modern architecture and one particular style. The rooms of the B&B “Dream” are very sophisticated and spacious, with a furniture of a good taste and quality. 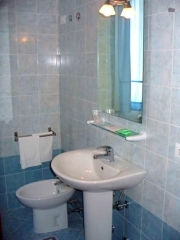 Every room has private spacious bathroom with shower and window. Please do not smoke in the rooms, in the B&B “Dream” there are rooms with balcony, where our guests can to smoke and relax even if the weather is bad. During the beautiful season the good Italian breakfast, is served below the porch, where you can eat your meal or smoke a cigarette. After 3 day or for a week’s stay we give you some discount. For you business you can to use our fax and Multifunction Color Printer. For any problem or special need you can always contact us. You will find a welcoming space, really comfortable and relaxing, where you can even enjoy, work or study in perfect peace. From Highway A4, after the tollgate go straight for about 5 km direction "Airport". Than on your right you'll see Petrol pump "Agip" with a service area "Bazera sud". After that you must to go straight for about 500mts and follow direction "Airport". Go straight for 1.5 km and take exit "Dese-Marcon", take the round and turn right at the 1-st exit (Dese). Just after the round the 1-st street on your left is Via delle Garzette. You will find our B&B there. go to Piazzale Roma, take the bus n. 19, 84 or 4 and get off at the last bus stop of Dese. Go straight for about 20 mts and turn right in Via delle Garzette (it's after Via Dei Fagiani). You will find our B&B there. From Venice - Mestre Railway Station you can take bus n. 15 and get off in Piazza Pastrello in Favaro, then change the bus and take n. 19, 84, 4 or 14 and get off at the last bus stop of Dese. You will find our B&B there. If you need our private transfer from/to Railway station of Venice-Mestre we will offer our car service with a simbolic cost. From Venice- Marco Polo International Airport take bus no. 15, get off in Piazza Pastrello in Venice - Favaro district, then change bus taking n. 19, 84 or 4 and get off at the last bus stop of Dese. Go straight for about 20 mts and turn right in Via delle Garzette (it's after Via Dei Fagiani). You will find our B&B there. If you need our private transfer from/to Airport we will offer our car service with a simbolic cost. From Venice - Treviso Airport take shuttle "Eurobus Service ATVO" direction Venice . When you arrive at the Historic Center of Venice (Piazzale Roma) take bus n. 19, 84 or 4 and get off at the last bus stop of Dese. Go straight for about 20 mts and turn right in Via delle Garzette (it's after Via Dei Fagiani). You will find our B&B there.